In this post I’m going to share with you an extremely simple technique that dramatically increased my conversion rates, in fact from the 160 visitors I received during the 3 day period of running this method, 117 of them submitted their email address. That’s a conversion rate of just over 73%. Plus it’s really simple & doesn’t even require any spend in advertising. In my example the product I’m going to be selling is related to making money, but this method can be adapted to suit anything. I firstly thought about my target market – I’m looking for people who want to make money so where’s the best place to find them? I decided a good place to promote would be on a website that sells cars, since this is where all the dreamers hang out – the people who browse all the nice cars wishing that they had that kind of money. So this is what I did next…. I decided that the best way to get a whole load of attention would be to sell a nice car, but something a bit wacky that would make people click onto the advert to see the image full size. I popped over to Google images & searched for “Pink Range Rover For Sale”. 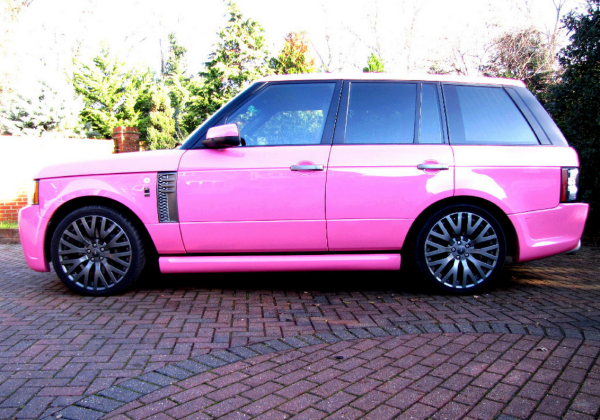 My idea being that if you owned a Range Rover, especially a pink one, you probably had money right? I had a whole load of different views of the car, front, side, back etc & I did that to all of them. Then in the advert I put *decals have been removed since photos were taken, paintwork is fine*. That just gave it the bit of extra legitimacy. Just as I expected the dreamers seen my ad, got curious & started heading over to my website where I’d placed a squeeze page. On that squeeze was a little video of yours truly telling them how I could help them make money online. I gave it the usual talk, how I’d quit my job, how I could help them quit theirs & how I could help them become successful online (all of which I have, and can). I instructed them that if they’d like my help all they need to do is enter their email & I’d send them a guide straight over. You guessed it… From 160 visitors I received 117 submissions. A conversion rate of just over 73%. & if the conversion rate itself wasn’t good enough, these people were all dying to make money online – they’d seen “my car”, they’d heard my story, they wanted to be taught and they were willing to buy whatever it was I was selling. So from a 3 day advert on a car classifieds site I cashed in around $4,500 and the bonus was that I didn’t even have to sell a car. Whilst this story may seem a little daft & may not appear to hold any value, think again. 2 Responses to "Increase conversion rates with indirect marketing"
but your website is down? why’d you take your site down? Haha, and I didn’t – it was a new HostGator account (first time I’d paid with card as opposed to PayPal on there) & apparently they’re doing random fraud checks or something now so I had to send my drivers license in… Just awaiting them to verify.